learn more about the art of crochet. The G.D.C.G .is a non profit organization. (However, We are not 501-3C designated). 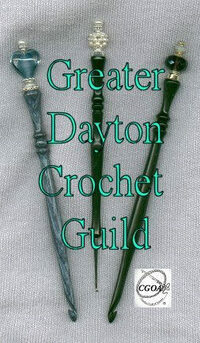 We are an associate chapter of the Crochet Guild of America. We would love to teach you to crochet and give you a venue for designated crochet time during stitch-ins. Our goals are geared toward charitable and educational purposes. You do not have to join to attend and There is no charge to attend any meeting. have a voice as to the endeavors of the group or sit on the board you must be a member. Board members who wish to hold the office of President or Vice President must also be a member of the national body CGOA. * Great fellowship with other avid crocheters!